Braxton Stafford holding his metal car sculpture. 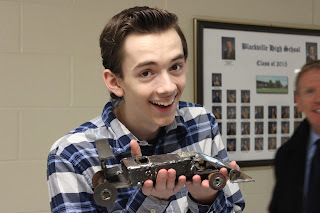 "I just want to build metal toy cars for the rest of my life," says Braxton Stafford a grade 12 student in Metals Fabrication at Blackville School. Students got a chance to tap into their creative side by creating statues using materials, such as nuts, bolts and old scrap metal. Many of the students googled their ideas or got them because they enjoyed it as an activity. Grade 12 student Josh Underhill made a basketball court with two players playing the sport. The idea came from the fact that he enjoys playing basketball with his brother. Before their projects were finished, they took their time in perfecting and creating as much detail as possible. The projects took from two classes to over a week to complete. Some of the students said that they were not considering this as a career; however, there were a few students who said they would pursue this further on in their life. To see more photos of the students and art work, click here. Photo by: Jacob Donahue & DeAnna Donovan.